In this edition of the SA parkrun newsletter, we welcome parkrun country managers from across the world, remind parkrunners that those parkruns with seasonal start times will be changing from 2 April. 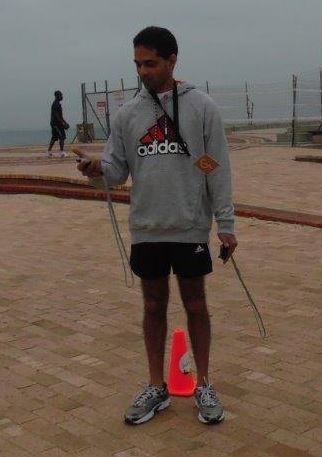 We look at a family who all held their respective age category records at one parkrun and celebrate our parkrunner of the week, Venesh Athimoolam from PE Hobie Beach. parkrun South Africa is hosting all the country managers from around the world at our annual conference, held this year in Cape Town. We have been very hectic preparing to meet country managers from as far afield as New Zealand and Russia, and of course there’s the little matter of preparing an agenda and programme for the next few days. We hope to have some exciting developments to report to you in the next newsletter. We also hope that several of us will have Two Oceans medals to boast about as well. Several of the parkrun country managers arrived early to enjoy a break in the Kruger National Park (I need to emphasise that this was all at our personal expense). 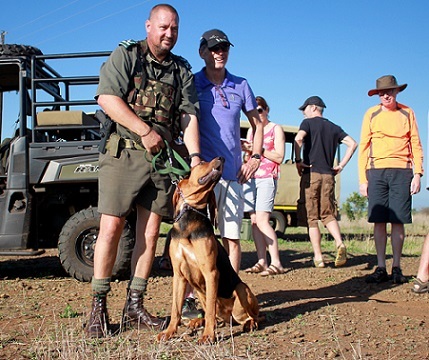 We all enjoyed some amazing game viewing and on the last morning we were given a demonstration of the courageous work the rhino anti-poaching squad do every day to protect these beautiful animals. 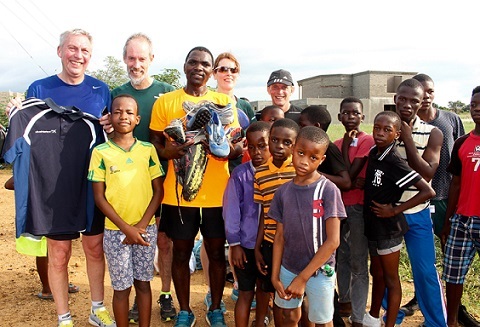 Dave Moorcroft, Paul Sinton-Hewitt (the founder of parkrun), Lordrick Mathonsi, Jo Sinton-Hewitt and I are seen here handing out shoes and clothes to Lordrick and the parkrunners at Nkomazi. These clothes and shoes were collected in UK by the international visitors and their communities. Since we were all staying close to Crocodile Bridge at the Kruger Park we took the opportunity to run the Nkomazi parkrun on the Saturday morning. 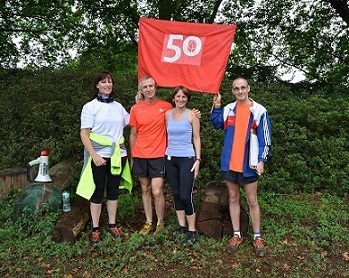 Event Director Lordrick Manthonsi had prepared a great welcome for us and we were greeted by enthusiastic local parkrunners, several of whom are close to earning their 50 club milestone T-shirts. The Nkomazi course is a challenging out and back run through thick sugar cane. At this time of the year it is also hot and steamy, so we were all covered in sweat when we finished. Still, we had lots of fun and were very grateful that Nkomazi is one of those parkruns which starts at 7am. However, it will return to its winter (8am) starting time from Saturday 2nd April as will the following parkruns; White River, Halls, Summerfields, Mogol, Oudtshoorn, Prince Albert. These are seasonal time changes. Please note that Kimberley and Upingtons start times will remain 07:00am throughout winter. I advise parkrunners visiting different parkruns to please check the actual website of these events for the correct start time and any cancellations! 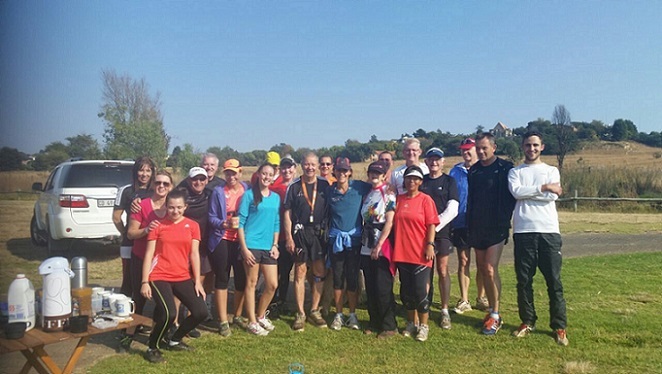 Franschhoek parkrun launched on 12 March in glorious Cape weather. 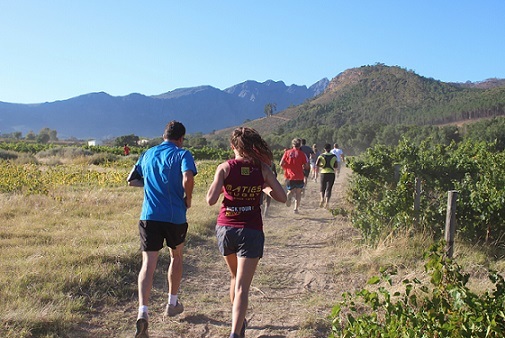 Run through the lovely vineyards of Rickety Bridge wine farm, the inaugural run attracted over 300 parkrunners, both visitors and local new parkrunners. Franschhoek parkrun joins a group of parkruns which are run through vineyards, which includes Root 44, Durbanville and Wellington. Jean Jeffery, under the guidance of Torrin, and her team have created a lovely 5km route which winds its way through the vineyards. We have no doubt the Franschhoek parkrun will be very popular and a valuable addition to the parkrun family. Not long to go until your next invigorating Saturday morning parkrun! MRPSport would like to congratulate Upington parkrun on their 2nd anniversary coming up this Saturday! MRPSport will be at the Upington parkrun this weekend. Our Maxed footwear range will be on display and if you are wearing Maxed you stand a chance to win a Maxed fitness hamper! You’ve been asking and we’ve been working on those achievement tees! We haven’t forgotten about them, parkrunners! Your t-shirts will be available from the end of May… our team is hard at work getting through the backlog to get your much-deserved tee to you as soon as possible. They will be delivered to your nearest MRP Sport store for collection. We’ll keep you in the loop with all the details throughout the ordering process. We promise they’ll be worth the wait! Until then, keep on racking up those parkruns! Vitality Active Rewards is now even more exciting. The Vitality Active Rewards with Smart Watch benefit, exclusive to Vitality members, combines with Vitality Active Rewards to motivate you to get even more active. As a limited time offer starting from 15 March and while stocks last, we are offering members who activate Vitality Active Rewards a choice of selected smart watches. 1. Download the latest version of the Discovery app. 2. Activate the Vitality Active Rewards with Smart Watch benefit. 3. Visit your local store to collect your Smart Watch. Learn more on www.discovery.co.zaTerms and conditions apply. My family of Carmen (wife), Rowan (son), Kate (daughter) & I are all part of the Florida raiders, a group of runners from Florida running club. We all got our respective age category records at the Hartbeespoort inaugural run. The chances of this happening usually if you consider the amount of parkrunners is very slim, as all it takes is one faster runner in any of those 4 categories to show up on the day and we wouldn’t have got this record. My wife was first in her category in the absence of Tracy Rankin, who is nearly always at inaugural events. Had she shown up then realistically all bets were off! Thanks Tracy, who subsequently ran it the next weekend and shattered Carmen’s record. For all 4 of us to hold the record at the same event at the same time is our parkrun trivia and perhaps a challenge to other families. One other bit of trivia from the raider camp is holding that Alex Weed holds 9 different parkrun age category records (60-64) at the same time. At Florida running club a lot of runners use parkrun as a quality speed training session in preparation for longer races, my family use longer races as training for parkrun! With all the parkrun stats available, it has certainly caught our imagination & become our chosen event. A fellow raider asked me just before a parkrun a few weeks back “are you going to save yourself for tomorrows 21”, my reply was quick and simple “no, this is what I train for”. Thanks Bruce for bringing this great initiative to South Africa. This is what volunteering should look like! Regular Root 44 parkrun volunteer, Leonie Roux is one of our most encouraging marshals! She loves to cheer everyone on, especially the juniors. Leonie works at the tuck shop of Eikestad Primary, so when kids spot her, they come running! Leonie walked her first parkrun at Root 44 parkrun just over 2 years ago, now she runs almost the entire 5km. She is always smiling when she runs and motivates other volunteers to cheer on our parkrunners! Volunteers like Leonie make parkrun a special place! There are some times in your life in the lead up to an event that you feel it is going to be something very special. Then the big day comes and you are at a loss for words to describe the feeling of being part of something so exceptional. 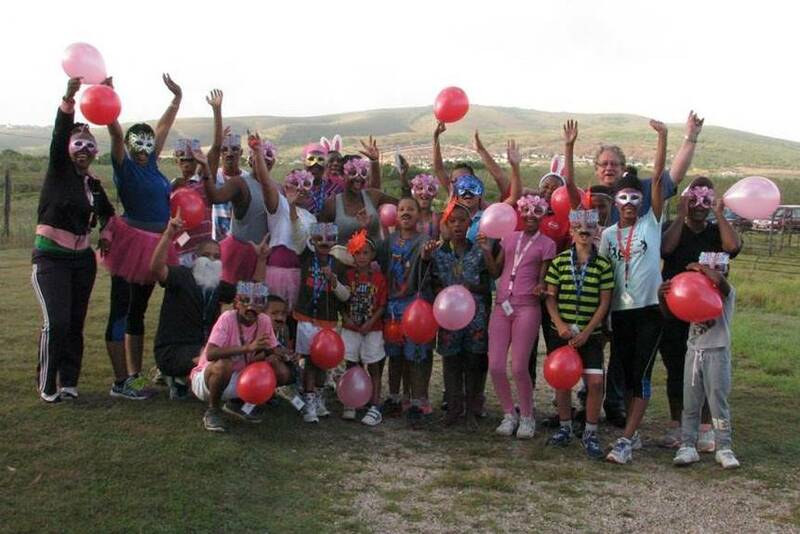 That, in a nutshell describes the first birthday celebrations of Hartenbos parkrun which took place on 12 March 2016.
parkrunners arrived in either red or pink whilst others wore crazy hats and fun costumes. There were several prizes awarded for best individual and group hat, costume, highest annual point scorers, volunteering the most, completing the most parkruns, and the parkrunner with the most improved time over the past year. More than 80 lucky draw prizes were also handed out. All of the prizes were donated. It was indeed a day that will be remembered by many for its fun and enjoyment as well as spirit of unity. For Event Director, Werner Morkel-Brink, it felt like his ‘own first birthday 26 years ago’! Thank you to all our parkrunners for their love and support over the last busy year! 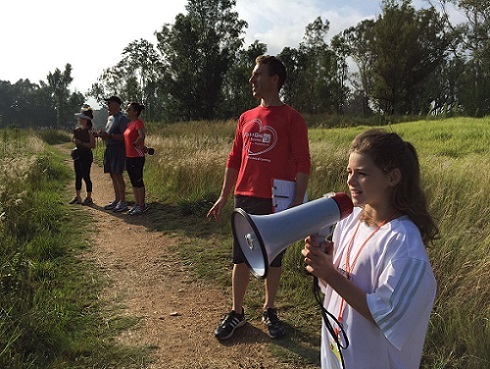 Emmah, affectionately known as “Emma-with-an-h”, began her volunteering stint at Modderfontein Reserve parkrun on 18 October 2014. At first I thought this was a ‘baby-sitting’ expedition masterminded by her parents, Christ and Heidi Sutton, whilst they participated in the parkrun, but I soon came to realise that this little junior was quite a sharp one! Knowing that youngsters have acute hearing and love gadgets, I decided to try her on scanners and the rest, as they say, is history. My faith in Emmah as a regular volunteer grew exponentially, so much so, that because she had learned most of the roles so well, it enabled me to ask her to train the first time volunteers on the various posts while I focussed on the more pressing issues as Run Director on event day. On that note she even grew into THAT role too, just a few weeks back on 27 February 2016! This young junior did an outstanding job in hosting 909 parkrunners and handed out responsibilities to some 40 volunteers (who all have great respect for her knowledge of parkrun). Simply put, Emmah Sutton has been an integral part in the growth of Modderfontein parkrun and we have been blessed to have her enthusiastic and vibrant energy in our dynamic “Volunteam”. Thank you, Emma-with-an-h for the many hours you have dedicated each week in your volunteering. How has parkrun changed your running: I was about to give up on running after an injury and parkrun was the lifeline which got me going again. Thank You parkrun! What do you like about parkrun: It’s my small way of giving back to a sport which I've enjoyed for so many years. Meeting so many amazing people from different walks of life and a special group of fellow volunteers make Saturday mornings at Hobie Beach the perfect start to my weekend. Most memorable or funniest parkrun moment: My most memorable run has to be my first ITB pain free one as that's when my confidence was restored. Why should others volunteer at parkrun? : It's easy, fun and very rewarding. In this edition of the SA parkrun newsletter, we welcome Thousand Hills to the parkrun family, we remember Chet Sainsbury and hear some inspirational parkrun stories. 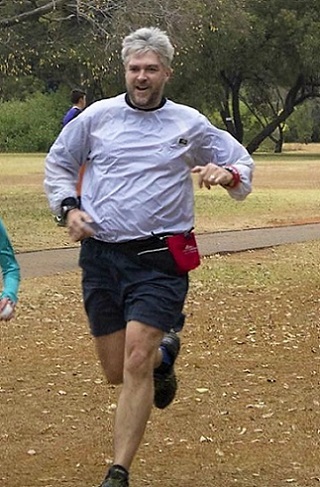 We also look forward to the parkrun international conference in Cape Town and celebrate our parkrunner of the week; Donald Klopper from Botanical Garden. Which is the toughest parkrun in South Africa? (Which is the toughest parkrun in the world for that matter?) For older South African parkrunners, the original Kidd’s Beach route was considered very tough and as result Kidd’s Beach parkrun started to lose runners. Eventually sanity prevailed and Kidd’s Beach parkrun found a new home on the beachfront and parkrunners flocked to the new route. Claims for the title of “the toughest” were made for Alberts Farm, for Nahoon Point and even for the cruel hill run twice at Botanical Garden. 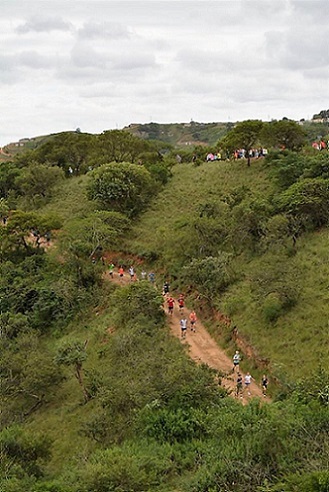 When Golden Harvest started a few months ago there were many who agreed that any parkrun which starts with a 300 metre steep uphill and then either goes straight up or down for 5kms in Johannesburg’s rarefied high altitude, has got to be the toughest. 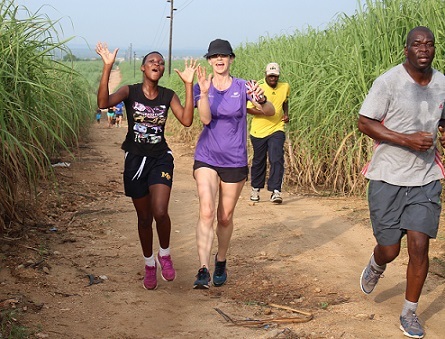 And then two Saturdays ago Tracy Whiting and her team in the Botha’s Hill area of KZN launched Thousand Hills parkrun!! The name says it all. Tracy, everyone who ran the Thousand Hills inaugural agreed, yours is the toughest parkrun by a long way. I always pride myself on not walking any hill at any parkrun no matter how steep. 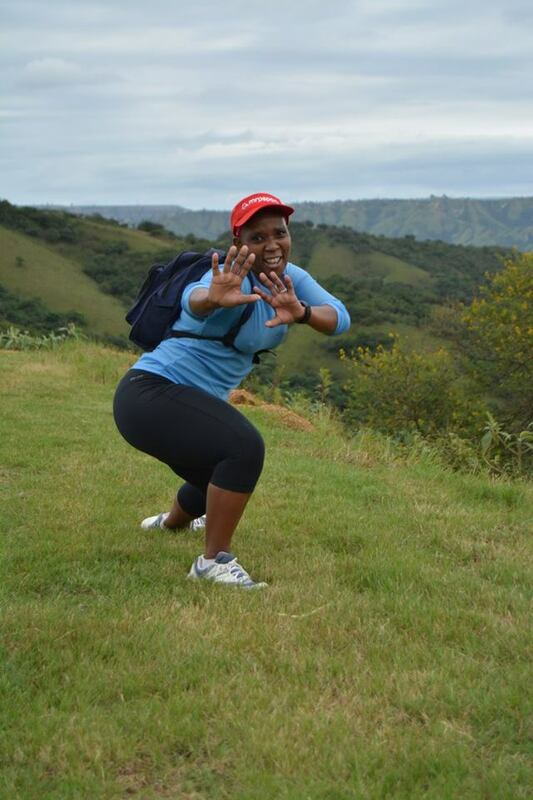 I was warned about the hills at Thousand Hills but was determined to run every single one. 10 minutes after the start I started walking and then later walking very slowly. As I was tackling the severe course, either hurtling downhill or trudging wearily up a path I thought, “This won’t do. This is far too mountainous, parkrunners will hate it. I’ll have to have a quiet word with Tracy about making some major changes.” I told myself that this should be horrible and that I should be hating the run. But I wasn’t. Reluctantly I had to admit I was enjoying myself and as hard as it was it was fun and it was exhilarating o be running in such beautiful surroundings. To my surprise that was the reaction of each runner as he or she finished. My legs were no longer stiff when I ran today but I haven’t forgotten Saturday morning yet! I noticed the smells after the first km or so, still heading down the hill. Crossing one of the dongas, I could detect two distinct smells: the spicy, aromatic smell of the bushes and a more organic, earthy smell of the soil. Altogether very pleasant and, I’ve no doubt, the rain of the previous night helped. As a survivor of Secunda and Witbank parkruns, this added an extra dimension to the experience! Environment is all important and uphills don’t matter so much, but my own preference is for a smooth, flat surface underfoot. This suit my elderly joints but, that said, move over Cape St Francis – you may have produced the best in South Africa yet! 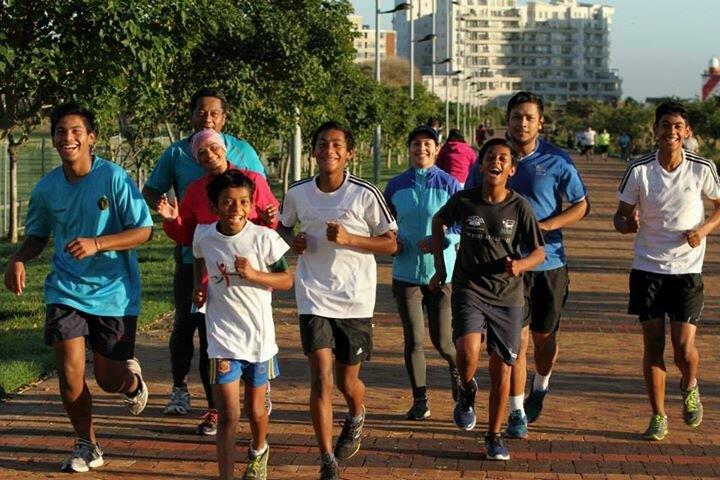 Speaking of superlatives, the Mallick family from Green Point parkrun recently achieved an amazing milestone. They have run over 1,000 parkruns amongst them. This really is quite an achievement for one family, even if it is a large family. Congratulations to Qiyaam, Naasih, Taahir, Mogamat Monieb, Hilmi, Wasimah, Rushda, Samier, Aneeqah, Raghmah and Mogamat Aslam. Apparently the driving force is the matriarch of the family, Faldiela Mallick, who ensures everyone is up and ready to run each Saturday morning. On Saturday Franschhoek parkrun will join the ever growing SA parkrun family. 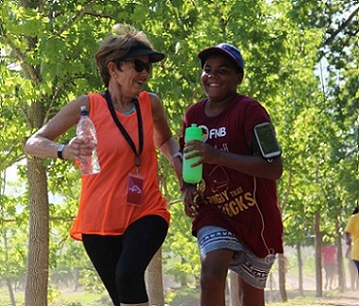 Debbie, “Debs” and Jean Jeffery have been the drivers of this parkrun set in the beautiful Rickety Bridge wine estate. It is distinctively French in flavour, much like the town of Franschhoek itself. Debs and Jean are expecting a large turnout for the inaugural run. parkrun global will be holding their international conference in Cape Town this month. Country managers from around the world will be attending and we look forward to some important discussions about the future of parkrun international. 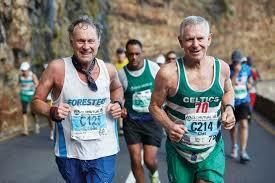 Some of the international visitors will be running the Two Oceans marathon. Gill will take the others to a Cape parkrun. It is with great sadness that those attending the conference learned that they will not be able to meet Chet Sainsbury, who was the driving force behind what makes the Two Oceans the great international road race it is today. Sadly, Chet passed away a few days ago having run the great race 32 times. He was also a parkrunner and enjoyed Rondebosch Common parkrun. parkrun South Africa sends its condolences to Annemarie and the Sainsbury family. One of those attending the conference will be Dave Moorcroft OBE. Dave has been a great supporter of parkrun and has been a driving force behind volunteerism in the United Kingdom. parkrunners who are rather pleased with their 5km PB time might be interested to know that Dave is a former World record holder for 5000 metres and his PB is 13 minutes! The Gym Tracker is a new innovation from Vitality and available to Planet Fitness and Virgin Active gym members. This tool allows you to view and track your gym attendance, making it much easier for Vitality members to meet their 36-gym visit requirement. 3. Click on “Gym tracker’ under 'Gym and Fitness’. Planet Fitness and Virgin Active gym members can also access the Gym Tracker from their Vitality Dashboard. Discovery Vitality members can now save up to 100% on their monthly gym fees with Vitality Active Rewards. Find out more here. Take charge of your gym benefit: try the Gym Tracker today. MRPSport continue to visit parkruns across South Africa with their exciting giveaways! Keep an eye out for when they will be visiting your home parkrun. This week, MRPSport will be at Lonehill, Shongweni and Kimberley parkruns. It would seem that the issue of dogs off leads has become a major issue, resulting in people getting tripped or bitten, other dogs being bitten and other incidents. Dogs must be kept on short leads at the parkruns where they are permitted and must be under close control at all times. Only one dog is permitted per parkrunner. We have had to come to a difficult decision where the few affect the many. This raises a serious safety issue at parkrun. From now on, anyone whose dog is off their lead does not get a result. This will be announced at the beginning of each parkrun, loudly and clearly. The volunteers who are in the funnel will not scan their barcodes. A health scare in mid-2014 resulted not only in a change in diet, but a major shift in terms of mind set, with a view to improving my life through exercise. A friend of mine introduced me to parkrun and I participated in my first run at Root 44 in August 2014. Over time I have reduced my weight by 20% and today complete 5kms in times I could only dream of. I now work in Ghana and am unable to join fellow runners on Saturday mornings. Despite this, I have (in the spirit of parkrun) continued to run in Accra at the same time as the SA parkruns get underway to coincide with when my family & friends participate. I was today privileged to have run with a Ghanaian runner, Obed, who kept me on pace and completed the course within seconds of my previous personal best. 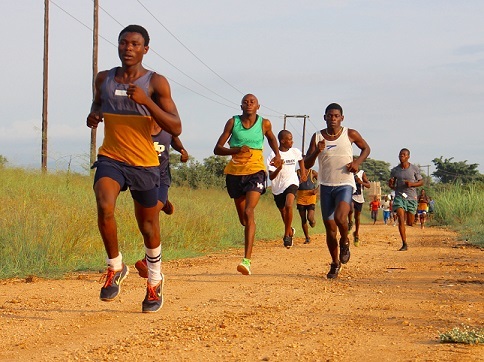 Obed has offered to run with me each morning so Accra's parkrun participants have doubled! Sub-29 minute times are now regularly achieved, despite the heat & humidity. I am well on track in my preparations for a first half marathon later this year. 10km routes are regularly completed and I am averaging 30km on the road each week. I today completed my 15th unofficial Accra parkrun thus reaching what would have been my 50th Saturday morning 5km run, something I set as a goal and have achieved together with Warren Venter, the friend who introduced me to parkrun, who soon will be completing his 50th parkrun at Root44. parkrun has changed my life and I am thankful to all for the inspiration, the challenges and the advice - I am a better person because of this and look forward to exercising: something I never thought I would be able to say as sports have not been something I have excelled in. Thank you parkrun, Bruce Fordyce and Torrin & Chris - I am indebted to you! I have been running for many years and have run 15 Comrades. Four years ago in June, after running the Durban leg of the SPAR Ladies Race and having a great run I went home and decided to do some spring cleaning. The day did not end well. I fell off a ladder from 3 metres and shattered my right femur in three places, it was such a freak accident. The prognosis was not a good one and even though I knew I would walk again; I didn’t know if I would ever be able to run again. I decided I was not going to let this beat me. My running buddies were all training for whichever races they were doing and I was left behind without any training partners. My hubby encouraged me to try out the Shongweni parkrun, so off I went on my first ever. I walked the 5km in a very slow time but was hooked. I can honestly say that parkrun saved my running life. Having people around and being able to run in a friendly and safe environment, together with encouragement from my hubby and daughter helped with my rehabilitation and gave me confidence in myself again. Here I am two years later, having represented KZN again in the SA X Country Champs in September last year and winning a team Gold Medal. I have just completed the Buffs half marathon and am feeling good about myself. Thank you for bringing this concept to South Africa. How has parkrun changed your running: I have improved a couple of eating and training habits since I started doing parkrun events, so I've lost around 10kg and improved my PB by about 5 minutes. I regularly run with my dogs after work, something that I never did before starting parkrun (my dogs are very happy about it!). In 2015 I also trained right through winter in for the first time in years. (2.5km), did the parkrun, and ran back home. You tend to remember the toughest days with the most fondness. Trail or Road Running? : Road running until I'm fit enough for decent distance trail running. I've taken a break from mountain biking since it takes up too much time. Running works well for me since a 40 minute run is quite a good workout, but with cycling it's barely the end of the warmup. Favourite volunteer role:: Results processing. It allows me to still run the parkrun with the crowd, sort tokens and socialise with the other volunteers and runners at the event. What do you like about volunteering at parkrun:: What's not to like about contributing to a regular, timed, free, volunteer-based, social running event?! Why should others volunteer at parkrun? : Volunteering is made easy by the fact that processes are well-known and streamlined. We can (and must) still use our own discretion when we make decisions; each parkrun has its own flavour due to the personalities of the volunteers who run it every week. If you find that there's something that irritates or frustrates you when you run a parkrun, you can volunteer to understand why things are done how they are, and to improve them. And you'll get to meet a varied bunch of awesome people, who are willing to give back to the cause. What fellow volunteers say about them:: He is a very passionate and positive parkrunner and family man. Always willing and happy to assist with a smile. Results processing fits him like a glove and he takes on the role with great enthusiasm - He is very detail orientated and definitely embodies the parkrun ethos.